Tails and Amy out on a date. Requested by Shadowbot. Matt Echidna and The Andyman hangin' out. Requested by Matt Echidna. Sondra �, requested by Shadowbot. Lil the Lioness �, requested by herself. Here's Sally and Julie-Su spending time together thinking about their guys. Requested by Shadowbot. Giggles said I was cute. I know, I'm way too shy for my own good. Requested by Selestial. Evil Sonic, (not the one you might be thinking of) requested by DarkSpawn. Neil O'Connor, requested by David McGrath. A Pic Exchange with Jetski Waverunner. Flynn Taggart, requested by Shawn Pennington. A Pic Exchange with Tundra Solo. 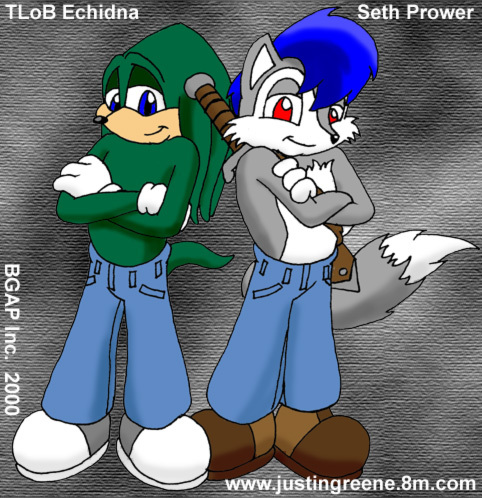 Seth and TLoB, requested by Seth Prower. Sonic, Sally, and Mega Man ZX �, requested by Anthony Lanuza. I must say, I've never been that good at humans, but it looks like watching DBZ and the Anime series Blue Seed started to pay off about here. DarrenKnuckel Telus Teraci � and Daniel D. Castrolin � were requested by SonicZelos. Inochi �, requested by Viatani. Andy and Tiff Hedgehog, requested by Andy Hedgehog. Zone 9 logo, requested by Sharky Fox. Seth and Tails Prower, requested by Seth Prower. Claws of Dark Choas, requested by himself. Liz of Dark Choas, requested by herself. A Pic Exchange with Neon Dragon. Neon Dragon �, requested by herself? Oops!